Following a critically acclaimed, sold-out run at the Almeida Theatre, Rebecca Frecknall’s ‘shiveringly beautiful production’ (The Sunday Times) transfers to the West End’s Duke of York’s Theatre this November. Please note this production features a gunshot and the smoking of real cigarettes. 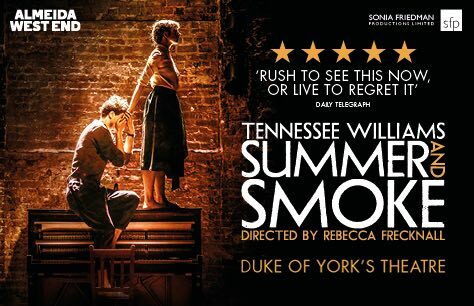 Me and my sister saw Summer and Smoke on Saturday 19th January (matinee) - absolutely brilliant.